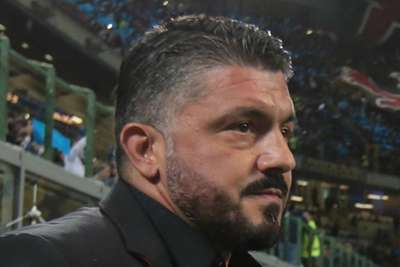 Gennaro Gattuso refused to blame Gianluigi Donnarumma for a late error that handed Inter a 1-0 win in the Milan derby. The AC Milan goalkeeper misjudged a superb right-wing cross from Matias Vecino in the 92nd minute, allowing Mauro Icardi to head into an unguarded net. Icardi also won the first derby of last season with a late penalty that completed a hat-trick, and the Inter captain has now scored five goals in his last four games against Milan. But Gattuso refused to single out teenager Donnarumma for criticism, noting Vecino should have been prevented from delivering the cross in the first place. "I don't want to pick on individuals," Gattuso told Sky Sport Italia. "There were errors from everyone in defence, as Ignazio Abate went down too quickly to block the pass, [Mateo] Musacchio misread the cross too. "We lost the game together, not because of Donnarumma. We lost because we didn't play with the right courage, we were distracted and conceded a naive goal." Milan saw their eight-match unbeaten run in all competitions come to an end as their season-long wait for a Serie A clean sheet continued. And Gattuso accepted the Rossoneri struggled to find a solution against Inter's high pressing tactics in Sunday's clash, with striker Gonzalo Higuain left isolated as a result. "Inter certainly deserved more than us, but if this game had ended 0-0, there would have been some real positives," the coach continued. "We played a style of physical football that we don't like to play, but we did it well enough. We could have passed better and done better on the counter. "Since the start of the season my team hasn't really held out for 90 minutes, but this time we held out so well even with the many set pieces. "The only regrets are that in the last 15 minutes we had so many counter-attacks and didn't make the most of them. Overall, it has to be said that Inter did more than us. "Inter are physically stronger, we have other qualities. We tried to challenge them physically anyway and I really liked the approach, playing a type of football we are not accustomed to. We had our chances too, but undoubtedly Inter had more opportunities."